I had never heard of this book before, and then my friend reviewed in on goodreads. I thought it would be great for my boys (4th and 5th grades), and when I asked them if they had read it, they both said, “Yes!” That doesn’t usually happen. I had no idea. Anyway, they had both read it, so I picked it up and started reading. It is so cute and fun! I read it in one sitting, so it’s a very fast and easy read. It’s very imaginative, and I think it teaches kids a great lesson about words, about using your imagination, and also about how one person can make a difference. I love Nick’s character. He is witty, imaginative, and funny. I also liked Mrs. Granger because of the teacher in me. I loved how the word just took off, and it reminded me of when I was in high school and “like” was just beginning to be used more, and how my drama teacher pounded it into our heads not to use it. Unfortunately, she was not able to stop the “like” movement, but that’s okay. 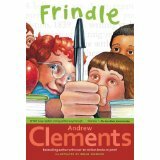 The word frindle took off in the same way. What a fun idea! This woud be a great read-aloud, but it’s also great for a silent read. It’s a clean read, so it’s great for everyone, which I like! Recommendation: 5 years and up (I have a four-year-old, and I don’t know if she would quite understand it yet.) as a read-aloud. I think it’s about a third grade reading level for a silent read.